This is to inform you that State Assemblyman for Kampung Tunku Lau Weng San will be organizing a dialogue session with residents of PJ Sri Aman Low Cost Flats today to discuss local issue. Residents are welcomed to participate. Dimaklumkan bahawa ADUN Kampung Tunku Lau Weng San akan mengadakan sesi dialog dengan penduduk Rumah Pangsapuri Sri Aman, PJ pada hari ini untuk berbincang isu-isu tempatan. Semua penduduk rumah pangsapuri tersebut digalakkan untuk menghadiri sesi dialog tersebut. THE Petaling Jaya City Council (MBPJ) will engage Selangor Economic Action Council and Housing and Local Govern-ment Ministry to discuss the issuance of Certificate of Fitness (CF) for the five blocks of PPR (Projek Perumahan Rakyat) flats in Lembah Subang. In response to a question raised by Kampung Tunku assemblyman Lau Weng San at the MBPJ full board meeting, mayor Datuk Mohamad Roslan Sakiman said the council was handling the matter with caution as the structures built on a former landfill involved complicated implications. “We cannot rush into a decision as the matter is serious. We do not want another PJS 3 Taman Sri Manja, whereby the council had been held responsible for treatment on the environment as it issued the CFs,” he said. A report that a total of RM89,000 was spent on Petaling Jaya Museum’s signage also raised eyebrows as several councillors said they did not see that many signs in the city and wondered how the bill could come up to such a staggering amount. Roslan agreed to the points and ordered an investigation to be launched on the matter. Bukit Gasing assemblyman Edward Lee again raised the issue of the Official Secrets Act (OSA) and asked the mayor if anyone in the council could declassify local council documents. The board was then told that deputy council secretary Ahmat Mahaayen Said had been given the authority to do so by the former Selangor Mentri Besar Datuk Seri Dr Khir Toyo. Councillor Mak Khuin Weng, who sits in the billboard site inspection committee with three other councillors, asked why the formation of the committee and its members were not recorded in the minutes of the full board and sustainable development meetings. “Even though the committee and its members is mentioned in the billboard guideline booklet, I cannot find any such records in the minutes,” he said. Councillor Cynthia Gabriel steered the board’s attention to death threats received by several councillors in the course of their duties. She said her car had recently been vandalised for the same reason. “We have sent a letter to the state informing them that the security of a number of councillors is at risk for helping the people. We will also send our officers to patrol the areas if need be,” Roslan said. On public complaints, he said the council was re-zoning garbage collection areas for higher efficiency. “Adjustments will be made to the list of 40 existing contractors upon Alam Flora’s recommendations. The figure will be increased to 112 by mid-May,” he said. He also directed heads of department to meet complainants and called for a sense of urgency to be inculcated among all officials when handling public complaints. The mayor also reiterated the effort of creating “Clean Zone” in the city, adding that the first on the list, Section 52, would be marked with signage and its accesses would be painted with apple green. Let’s find a solution: Lau (left) discussing with affected residents at the site of the Paramount View Condominium project. THE noise pollution as a result of an ongoing condominium project called Paramount View Condominium has been a cause for concern for a group of residents in Section 22, Petaling Jaya. “The project is located at the old squatter area of Taman Aman, near the Paramount Garden LRT station, and is near the Section 22 and SS1 residential areas, as well as the Sri Aman Flats,” said Kg Tunku assemblyman Lau Weng San. “The construction activities and heavy vehicles moving in and out have caused sleepless nights for the residents. “The construction workers are only allowed to work from 8am to 6pm, but there were times when they worked right up to 9pm or even 1am!” he said. “The local council (Petaling Jaya City Council or MBPJ) never approved the longer working hours because the project is located near residential areas. “We want to achieve a win-win solution. During a meeting I organised last week between MBPJ, the developer and residents, we managed to reach a consensus that the developer can work from 7am to 7pm till November (when the project is estimated to be completed). The project is supposed to be 12 storeys high with 233 units built in total. “The heavy vehicles moving in and out of the construction site caused the previous access road from Lorong 22/44D to neighbouring lanes to collapse, and the developer has yet to have it repaired,” said resident Abdullah Sani, 42. Another resident, Hisham Zafian, 40, said the houseowners are also concerned about the increase in traffic at the present access road, Jalan SS1/25, once the project is completed. Lau said the residents had suggested having the entrance to the condominium through the existing landscaped garden on government TOL (Temporary Occupational Licence) land. “I will check if the proposed access is a viable option or not, since Jalan SS1/25 is connected to Jalan 22/44. There are also technicalities to look into and whether it will affect other residents,” he said. YOU can’t use our roads to get to the new condominium. That’s the stand of residents living at Jalan SS1/25 and Jalan 22/44 in Petaling Jaya, angered by the on-going construction of the Paramount View condominium in the Kg Tunku area, near the Paramount LRT station. The pro-tem action committee, comprising residents living paround the project, is considering putting up a wall at the “blind ends” of Jalan SS1/25 and Jalan 22/44 to prevent the roads from being used as entry points for the condominium, which began construction in 2006. The planned wall will be 20m long and 1.75m in height, said a resident, who declined to be named. The main complaint has been that the project’s developer had put up a signboard stating that Jalan SS1/26 would be the entrance, but is not using it. “As it stands, both Jalan SS1/25 and Jalan 22/44 are barely 9m wide. These roads will not be able to handle the extra traffic from this new development,” said another resident. The residents’ committee claims that under the Petaling Jaya City Council guidelines, the access road should be at least 15m wide. Apart from the anticipated congestion, residents are also worried about condominium residents parking on the road kerbs — as is usually the case outside many condominiums in PJ. The Paramount View condominium is slated to have 233 units, and could result in an extra 1,000 people in the neighbourhood with an existing population of over 3,000 residents. The residents’ committee wants the local council to insist the developer sticks to its original plans. They suggest the council make Jalan SS1/26 as the main access road, then on to Jalan 21/27. “It will cost some RM500,000 extra to build a ramp from the condominium to Jalan 21/27. This proposal will only affect the entrance of SS1/26,” said a resident. Meanwhile, Selangor State executive councillor for Local Government, Study and Research Ronnie Liu Tian Khiew, said a review of the project’s plans could be possible. “I need the complaints from the residents as no one has brought the matter on the condominium to my attention. I will act on it upon receiving the official complaint,” said Liu when contacted yesterday. Article 72. Privileges of Legislative Assembly. (1) The validity of any proceedings in the Legislative Assembly of any State shall not be questioned in any court. (2) No person shall be liable to any proceedings in any court in respect of anything said or any vote given by him when taking part in proceedings of the Legislative Assembly of any State or of any committee thereof. (3) No person shall be liable to any proceedings in any court in respect of anything published by or under the authority of the Legislative Assembly of any State. (4) Clause (2) shall not apply to any person charged with an offence under the law passed by Parliament under Clause (4) of Article 10 or with an offence under the Sedition Act 1948 as amended by the Emergency (Essential Powers) Ordinance No. 45, 1970. (5) Notwithstanding Clause (4), no person shall be liable to any proceedings in any court in respect of anything said by him of the Ruler of any State when taking part in any proceedings of the Legislative Assembly of any State or any committee thereof except where he advocates the abolition of the Ruler's position as the constitutional Ruler of that State. You won't need a legal counsel to help you understand the above, do you? The implication's quite simple. The Federal Court can blab their declarations (note: not binding judgement) 'till Kingdom Come, and it's still considered as 'advisory' since the above excerpt came from the Federal Constitution of Malaysia, supreme law of the land, etc. Somebody's getting paid, BIG time. Daripada mengeksploitasi isu-isu yang tiada kaitan dengan urusan pentadbiran kerajaan negeri dan tugas awam, Khir Toyo harus memberi lebih perhatian peranannya sebagai Ketua Pembangkang demi mengimbangi dan memantau perjalanan pentadbiran kerajaan negeri. Buat sementara waktu, prestasi Khir Toyo sendiri sebagai Ketua Pembangkang adalah amat mengecewakan. Bahkan kehadiran beliau dalam persidangan DUN Selangor amat mengecewakan. Khir Toyo mungkin juga tidak mengetahui bahawa ADUN BN untuk Taman Templer, YB Datuk Subahan Kamal juga pernah membangkitkan perkara ini dalam sidang DUN dan beliau mempunyai pendapat yang amat berbeza dengan Khir Toyo. Kalau dalam BN sendiri pun mempunyai pendapat yang berbeza, apa gunanya Khir Toyo mewar-warkan bahawa beliau akan mengeksploitasi isu ini? Bukankah lebih baik untuk beliau menumpukan sepenuh perhatiannya terhadap kerja-kerja pemantauan pentadbiran kerajaan Selangor? I support the move to make local council sub-committee meeting minutes be made available to the public to promote transparency. Under the current legal framework, there will be legal implications if these documents are used/published openly without first being declassified. There will be no legal implications to my knowledge if these documents be published after declassified. Currently, elected representatives are allowed to participate the meeting without voting rights. Participation to any meeting of this kind to outsiders, including members of the media, is only done by invitation. The state government is in the process of enacting an Enactment named Freedom of Information (FOI) Enactment which could govern that all minutes of meetings of local council's committee meetings be published openly to promote transparency and to ensure the public that decisions made at these meetings are fair and follows proper procedure. There should be no legal implications if observers are invited to attend these meetings officially. As for opening the meeting to outsiders, one should bear in mind that a lot of discussions on issues and problems are premature in nature, that the council and the councillors need more time to deliberate on the matters. Therefore, before any decision been made, it could create unnecessary confusions and misunderstandings among the public if the meetings were to be conducted openly especially for meetings when the council has not made any decision or the council want to refer the matter to the higher authority. I think it will be good for all of us to explore how Scandinavians practice these principles of openness in their countries. The FOI enactment is one of the many steps we can take, not only to fulfill our electoral pledges but to promote greater transparency and become the role model not only to other Pakatan-ruled state governments but also to the Federal government. Having an FOI enactment is not the only way towards greater transparency but education to the general public including media players is equally important as all stakeholders must be taught and educated on the meaning of greater transparency. Matters related to national security and terrorism should also be deliberated. Free flow of information should also mean more openness in media reports to both ruling and opposition parties. PAKATAN Rakyat assemblymen, when asked on their stand on the use of the OSA, focused on the need for caution in the handling of government documents. “While I support greater transparency and the state itself has initiated discussions with several NGOs under the Coalition for Good Governance to look at a Freedom of Information enactment (FOI), the existing regulations are still in effect,” said Seri Setia assemblyman Nik Nazmi Nik Ahmad. “MBPJ’s public hearing meetings have been done in the open where the press can report on the different interests at play. “However, certain sub-committee meetings might need to be closed-door due the nature of their discussions. I think a balance between being transparent and having an efficient decision-making process must be struck,” said Nik Nazmi. Kampung Tunku assemblyman Lau Weng San echoed Nik Nazmi’s concerns and said that the minutes should be made available to the public to promote more transparency but cautioned that until the documents were declassified, there would be legal implications involved in presenting the documents publicly, which was the case with the leaked MBPJ meeting minutes. Kota Damansara assemblyman Dr Nasir Hashim differed in his view and said that the meetings should be made available to the public and where necessary, decisions must be open to review. “Meetings tend to be secretive or not transparent when there are possible hidden agendas or the fear of being unnecessarily sued or accused for being insensitive. “It is the ongoing hope that those involved, be it the council members, people’s representatives or the public have understood the rules of the game so that they will always be responsible enough to make their own decisions. “We should push for transparency and I strongly believe that the public is mature enough to participate and judge us. Such a move will certainly build confidence and empower the people,” said Nasir. THE Petaling Jaya City Council (MBPJ) has been urged to conduct an independent traffic study for the proposed development on the Football Association of Selangor (FAS) field in Kelana Jaya. The proposed development involves a complex with 92 units of shop offices and a basement car park, and residents in the vicinity are worried that the project would add to the traffic chaos they are now facing daily. About 10 representatives of the developer and about 30 residents staying around the area attended the first public objection hearing on the project conducted by MBPJ secretary Puasa Mohamad Taib on Monday at the MBPJ complex. Also present were Petaling Jaya Utara MP Tony Pua, Kelana Jaya MP Loh Gwo-Burne and Kampung Tunku assemblyman Lau Weng San. Tan Sri Dr Lau Ban Tin, representing the developers, said that the land was privately-owned and was never a public recreation area. Lau said that even the existing access road used by residents had not been surrendered to the authorities and was in effect still privately-owned. He said the development had already been scaled down from the previous plan consisting of four condominium blocks, one 23-storey office block, one eight-storey service apartments and one six-storey commercial and carpark podium. “The FAS training centre will be relocated to a three-storey sports complex with full facilities for the Selangor football team in Section U15, Shah Alam,” Lau said. “The Yayasan FAS and FAS hope to generate recurring income from this project because right now, they don’t even have the funds to maintain existing facilities,” he said. A Runding Trafik MZK representative also presented a traffic impact assessment (TIA) report during the hearing. Taman MegahMas residents’ association secretary Dr Chau Foon Yeap said that the traffic congestion continued to be a nightmare for the residents due to cars coming in and out of the tunnel leading to Ara Damansara. “This project and other projects coming up in the area will add to our problems. We can’t even get out of our houses during peak hours,” he said. According to former Taman MegahMas residents association chairman S.K. Tan, the problem has been going on for at least eight years and yet the MBPJ did not have a solution for the two tunnels which residents claim are illegal to begin with. “The MBPJ should resolve this problem before approving the project,” Tan said. Another resident said that the TIA report projected around 1,000 cars at the main access road during peak hours but the previous traffic study conducted by the MBPJ for the tunnels had recorded more than that. Pua asked the traffic consultant if the figures took into account the Phase 3 development comprising two blocks of multi-level commercial blocks. “No, it doesn’t, but we took into consideration the projected growth rate of traffic in the area,” the consultant said. Pua then asked the developer to conduct a more thorough traffic study, taking into account the proposed commercial buildings. All-Petaling Jaya, Selangor, Resi­dents Associations Coalition (APAC) chairman Liew Wei Beng said that under the Petaling Jaya Local Draft Plan 2 (RTPJ2), the land was proposed as a commercial area. “We have not had the RTPJ2 objection hearing sessions and the draft plan has not been gazetted,” Liew said. According to Lau, the land status had already been converted in 2003. Liew said the council should appoint an independent traffic consultant to conduct another study. Another resident asked why 29 units of the shoplots had been sold when their planning approval had expired. It was previously reported in StarMetro that the planning approval had expired on November 30, 2007. Pua said that the views from all parties would be taken into account when the One Stop Centre committee makes its decision. He said although the Selangor Economic Action Council had given the approval for the project in October last year, it was still subject to approval by the MBPJ. I attended a program on Strengthening the understanding of CEDAW (Convention on the Elimination of All Forms of Discriminations Against Women) in De Palma Hotel, Shah Alam on 15th April. The programme was organised by Selangor Exco YB Rodziah Ismail, who is overlooking the women affairs in Selangor. My assistants spotted this guy in my constituency, pasting illegal money borrowers' stickers all over the place. It seems like Ah Long nowadays are not using their own staffs to do the work for them. Instead, they "outsourced" the work to college students and teenagers who want to earn extra pocket money. PRIME Minister Datuk Seri Najib Tun Razak’s recent call to do away with billboards featuring him and Cabinet ministers has received positive response. Selangor local government research and studies committee chairman Ronnie Liu said billboards should not be erected aimlessly. He said the billboards should be able to furnish relevant information that would be of benefit to the public. “There is no point in displaying a giant-sized image of the Prime Minister or ministers without the information needed,” he said. Liu agreed with Najib who said that public funds were being wasted by having too many billboards that bear the image of the PM and his ministers. He said the images of the individuals should not be overplayed as this would not serve the purpose. Kuala Lumpur mayor Datuk Ahmad Fuad Ismail said that he would have to wait for further clarification on Najib’s call not to have faces of politicians on billboards and banners. The mayor said 90% of billboards in Kuala Lumpur were owned by the private sector with the balance by various ministries. “Billboard owners would normally get help from the private sector to put up the visuals including those from the ministries,” he said. “We have to get more details such as does it include all politicians, including MPs, before we can proceed further,” Fuad said. The Kuala Lumpur City Hall (DBKL) had recently issued an ultimatum that billboards in Kuala Lumpur must comply with DBKL guidelines and owners who fail to do so were given a maximum of three months to take them down. Fuad said the guidelines issued in December last year gave importance to factors like safety, location, design and visuals displayed, including aesthetic value. He said a one-stop centre would be set up at City Hall soon to manage all matters related to billboards including licences. Meanwhile, Petaling Jaya mayor Datuk Mohamad Roslan Sakiman said the city council would wait for directive from the government to take further action. “We will have to wait for the directive or further clarification before taking the next step,” he said. The billboard industry in Petaling Jaya was recently revamped in an effort to weed out unscrupulous operators with the launch of billboard guidelines that will be adopted by other local councils in the state. Kampung Tunku assemblyman Lau Weng San said he had no objection to the Prime Minister’s call on not putting politicians’ photographs on billboards or banners. However, as such billboards are normally contributed by the outdoor advertisers to fulfil their social corporate responsibility, they should still be used to spread social awareness messages. “If the authority does not put up photos of politicians, the billboards should be put in good use to spread public awareness campaign such as anti-crime and road safety,” he said. Najib’s call received immediate response from Perbadanan Putrajaya (PPj), the local authority for Putrajaya. PPj city services director Datuk Ghani Ahmad said billboards erected in areas under the jurisdiction of the local authority were brought down soon after Najib made the request. “However, we have no authority over similar visuals in private buildings and within office complexes or compounds,” he said. 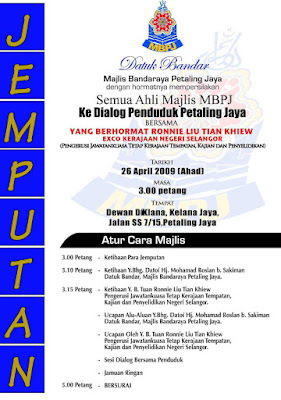 I attended a ceramah in Kampung Air Panas, Kerling, Hulu Selangor on 12th April 2009. About 200 villagers turned up for the ceramah. Also speaking were DAP ADUN for Subang Jaya, YB Hannah Yeoh and DAP Councillor for Hulu Selangor District Council, Sdr Santokh Singh. We talked on a lot of issues including the latest political situation in the country as well as the latest by-elections in Bukit Gantang, Bukit Selambau and Batang Ai. Perdana Menteri baru Dato’ Seri Najib Tun Razak semalam mengumumkan perlepasan 13 orang tahanan ISA daripada Kem Tahanan Kamunting. Antara mereka yang dilepaskan ialah dua orang aktivis Hindraf, R. Kengdharan dan V. Ganabatirau. Saya menyifatkan tindakan ini hanya merupakan satu sandiwara kerana kerajaan harus melepaskan semua tahanan yang masih ditahan di dalam Kamunting di bawah ISA sebagai langkah pertama jikalau kerajaan serious dalam memulihkan hak asasi rakyat di bawah pentadbiran beliau. Saya tidak memahami logik kerajaan pusat dalam perbuatan ini apabila nama YB M. Manoharan, ADUN DAP untuk kawasan Kota Alam Shah, Klang tidak disebut sebagai salah seorang aktivis yang akan dibebaskan. Pada pilihanraya umum ke-12 yang lalu, YB M. Manoharan telah bertanding di kawasan DUN Kota Alam Shah, Klang dan menang dengan majoriti sebanyak 7,184 undi biarpun beliau masih ditahan di Kamunting di bawah ISA dan tidak dapat berkempen sendiri. Kejayaan besar yang dicapai oleh beliau bukan sahaja satu kejayaan yang besar untuk DAP dan beliau sendiri, malahan ianya juga merupakan satu mesej yang jelas kepada kerajaan bahawa kerajaan tidak boleh terus menahan mereka yang tidak bersalah tanpa perbicaraan melalui ISA, khususnya dalam kes Sdr M. Manoharan ini. Jikalau kerajaan pusat serious untuk mengikis persepsi negatif rakyat terhadap kerajaan pusat sebagai kerajaan yang menekan hak rakyat, maka kerajaan pusat harus melepaskan semua tahanan ISA khususnya YB M. Manoharan yang merupakan seorang wakil rakyat. Saya tidak menampak sebarang untuk kerajaan pusat terus menahan beliau di bawah ISA ini melainkan kerajaan masih ada kebimbangan tertentu sebelum YB M. Manoharan dapat dibebaskan. Selagi kerajaan pusat tidak berbuat demikian, rakyat belum dapat meraikan kemenangan sepenuhnya terhadap akta ISA. My predecessor is speaking vehemently lately on issues related to traffic dispersal surrounding Paramount View Condominium. It will be interesting that my predecessor is equally concerned about having proper consultations with taxpayers before putting any projects or eye-sore in the middle of a green lung or open space, especially in this case where there are complaints from the residents that the condominium should not have been there at the first place. Perhaps it will be good if my predecessor could throw some light at the end of the tunnel as to why the whole gigantic project could be approved during his tenure as MBPJ councilor and Kampung Tunku Assemblyman. It will be a short-sighted approach to only focus on the traffic along Jalan SS1/26 generated from the high-density condominium project as traffic in Kampung Tunku is already heavily congested. As it is today, traffic along Jalan SS1/22 and Jalan SS1/36 (Jalan Baiduri) is already very busy during peak hour, now the roads will definitely be pounded with more vehicles with the completion of Paramount View. It is surprising how this important factor was overlooked when the authority approved the project arca 2004. I have requested a report of Traffic Impact Assessment (TIA), which is a standard requirement for any application of development order (DO). Unfortunately, I was informed that it was not done then. Residents living surrounding the area are raising various disputes about various non-compliance of the structure with various safety laws and regulations of the authorities. The exemption of a proper TIA is might only be the tip of the iceberg. In fact, solving the traffic problem along Jalan SS1/26 alone. Even connecting Jalan SS1/39 to Jalan 21/1 will not help to reduce the traffic volume in Kampung Tunku as a whole. By doing that, we are merely handling part of the problem whereby the traffic congestion in Kampung Tunku should be dealt with in a holistic manner. Anyhow, the council has engaged the necessary independent professional body to study the proposal. Before we can even deliberate on how to solve this problem, it will be meaningful if my predecessor could enlighten us on how could a high density project be approved during the previous administration when traffic volume in Kampung Tunku started to surge since four years ago. By all means, it seems like it is no longer viable to build an access road to Jalan SS1/26 anymore. So the residents of Jalan SS1/26 could sleep soundlessly but the ultimate problem on hand remained unsolved. IT’S no April Fool’s Day joke when you find your car missing today if you have parked it at an illegal spot earlier. It has probably been towed away by enforcement personnel of the Petaling Jaya City Council (MBPJ). It was announced at the MBPJ full board meeting yesterday that effective today, cars or other vehicles parked illegally in designated towing zones in Petaling Jaya would be towed away. According to MBPJ enforcement de­­partment head Mohd Fauzi Maarop, Zon Tunda (towing zones) signboards have been put up at various locations in the city for the past one month. The locations are Section 8, Section 52, Jalan Chantek in Section 5, SS6 in Kelana Jaya, Section 14, SS2, and Damansara Uptown in SS21. A motorist will have to settle the RM300 compound before he can get back his car from the storage area in SS8/2. He will also be charged a storage fee of RM10 for the first day, followed by RM5 for each subsequent day the car remains there. “We will put a chalk marking on the road after the cars are towed away and the police will also be informed when an operation takes place,” Fauzi said. Councillor Chan Chee Kong said the RM150 charged by the towing company for each car towed was high compared with market rates. According to mayor Datuk Mohamad Roslan Sakiman, the company was hired through an open tender process and only three companies submitted proposals. Fauzi said if the councillors felt that the charge was too high, they would not award the contract for the time being and the enforcement team would make do with the council’s one tow truck. Councillor Derek Fernandez, meanwhile, raised the issue of the confidentiality of the MBPJ sub-committee meeting minutes, saying that some of the documents were sent to several PJ assemblymen. According to an officer from the MBPJ legal department, the minutes are confidential and classified under the Official Secrets Act. Fernandez said he would lodge a police report regarding the circulated documents. Another hot topic debated at the meeting concerns the decision against the waiver of the RM10 dog licence fee for the disabled and senior citizens. Councillor Tang Fuie Koh wanted the matter discussed again but councillor Latheefa Koya insisted that all the views had been considered during the committee meeting. Councillor Anthony Thanasayan said dogs were important to the disabled and supported the motion for the issue to be brought back to the committee. “This will involve the re-drafting of our bylaws. The RM10 is an administrative cost and it doesn’t make sense that someone can afford to keep a dog but not afford the RM10 a year,” Latheefa said. In his wrap-up speech, Kampung Tunku assemblyman Lau Weng San asked the council to be prepared for the PJ redevelopment plans under the stimulus package announced by the Selangor government. “Most of the planning approvals issued in PJ are for commercial and mixed development. Until and unless we have an efficient transport system, the city can’t cope with the additional traffic. The council is responsible for solving the traffic issues in PJ,” Lau said.